Large Pool. Jacuzzi hot tub, Circular Seating BBQ Fire Pit area and ping pong table. Farmhouse, Cottage and 2 x Annexes available depending on group size. Exclusive use at all times. Rural Andalusian style farmhouse & adjoining converted bakery plus 2x separate annexes, each with with a double bed and single bed with private ensuite bathroom. Sleeping up to 20 in beds. OUTSIDE Courtyard with seating for 20 plus. Covered Dining area with outside kitchen and chill out lounge area. Large gas BBQ, Traditional Coal oven. Large fire pit, ideal to all come together. Large private free form pool, along with hot tub jacuzzi, sun loungers and sun chairs provided. Ideal for large Groups or several families , providing lots of privacy from each other ,yet having large communal areas to come together. 2 x cots available at supplement. We renovated this Cortijo, retaining its traditional feel. The Cortijo is situated just 10 minutes from the white washed village of Riogordo. The Lake is just 15 minutes with restaurants and 25 minutes you will hit the beach with many beach cafes with a true Spanish feel. Ideal for those seeking peace, tranquillity and relaxation in a truly outstanding property. Cortijo Cuscurro and Horno de Lena lies amongst olive groves with mature gardens with colourful shrubs trees and a unusually shaped pool along with hot tub jaccuzi. VERY SPACIOUS VAULTED LOUNGE with TV. , DVD, stereo, DVD collection, CD collection. Very airy with ceiling fans o escape the midday sun. Large log burner for winter lets and Christmas. WiFi available. included in price for peak season. Please ask for connection other times at a small supplement. Luxury well equipped Farmhouse kitchen with centre island. Double professional Electric cooker with gas hob. Large family bathroom with shower and jacuzzi bath. Master bedroom with private ensuite , enjoying its own private terrace to enjoy morning coffee overlooking the pool and mountains. Family Suite with 4 single beds. Can be made up as 1 double and 2 singles on request. The adjoined cottage has its own kitchen with oven, tea coffee making facilities along with 2nd lounge area with a double sofa bed. TV with dvd player. There is a double bedroom and 2 X twin bedrooms. Each Annexe has a double bed and a single bed with private ensuite bathroom. Riogordo is a typical Moorish style 'white' rural Spanish village. It nestles at an altitude of 400 metres in the hills just 35 minutes drive inland from Malaga Airport in the Axarquia region of Andalusia. Malaga City is not too far away for a day of Culture. The area benefits from its proximity to the coastal area of Torre del mar with beaches , fish restaurants, but has generally remained unaffected by mass tourism. Prices are Spanish prices here , not tourist prices. Shops and supermarket owners are friendly and accommodating, yet very reasonably priced. You can eat out very cheaply or enjoy cooking in the Cortijo , BBQs and even have paella cooked for you in the Courtyard during your stay. The nearest restaurant is Ortegas, famous for its slow cooked lamb, among many other dishes. Shopping available for your arrival. Riogordo is famous world-wide for its annual 'El Paso' at Easter; with a cast of over 400 inhabitants it is unique. It also has numerous bars restaurants, shops and even a large supermarket. The unique town of Comares can be seen ,clinging to it's mountain top it is visible throughout valley. It still has the remains of it's Moorish heritage. A town of narrow streets , a central plaza & stunning views of the Axarquia & the sea. Julian and myself, lisa, purchased our dream home 19 years ago. I myself grew up in Spain but returned to UK where we married and started our family. Our dream was to restore a CORTIJO in Andalucia. So with our two young girls we started the project and made CORTIJO Cuscurro our dream family home. We converted the main Famhouse into a lovely home with lots of love and care retaining the traditional features, yet having all the mod cons we had become accustomed to. The a Bakery adjoining became a holiday rental. We have had many happy years providing our guests with a stunning and relaxing location to holiday. We are delighted to have many good reviews and lots of returning guests, Our girls left the nest 6 years ago and we have now moved locally to enable us to provide more accommodation to our guests. We live locally and take pleasure in ensuring all goes well for our guests during their stay. We are at the end of the phone should you need anything and visit by arrangement to clean the pool and jacuzzi spa. 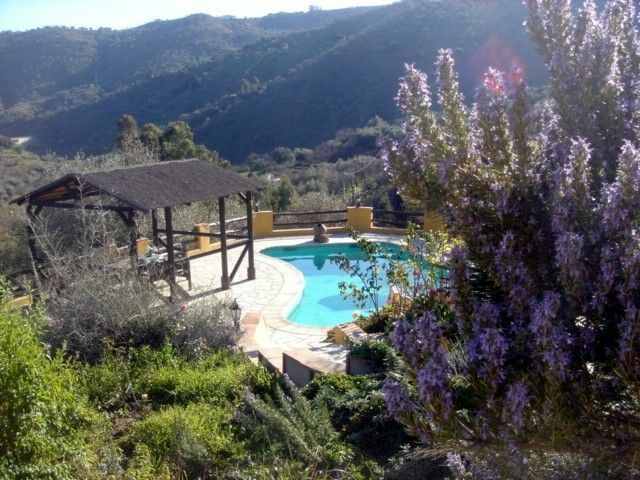 CORTIJO Cuscurro is for guests who enjoy seclusion, relaxation with stunning views all round. We fell in love with the views and nature that surrounds Cuscurro, and we know you will too. There is everything you could possibly need in the CORTIJO. This is more a home than a rental. Riogordo is nearby with tapas bars , shops, great butchers, bakers . All at cheap non tourist prices Christmas is a joy in the Cortijo. We decorate the house ready for your arrival. The Vaulted lounge is such a pleasure. New this year we have a fire pit. It's been a great hit so far. 2 X NEW SPACIOUS ANNEXES, AVAILABLE FOR LARGER GROUPS DEPENDING ON GROUP SIZE SLEEPING UP TO THREE MORE GUESTS IN EACH ONE WITH PRIVATE EN SUITE FACILITIES. Lots of space and privacy for large groups. Great for family groups as well as groups of friends. Retreats, workshops and holidays. Ideal for Hiking. Ideal for birdwatching The Courtyard is a stunning place for all to get together , yet this Farmhouse provides guests with a lot more privacy than most when they need it. The features of this property are never ending. Main farmhouse has family bathroom with jacuzzi bath, large walk in shower and toilet. En- suite bathroom upstairs has luxury shower with glass shower enclosure. Vanity unit with white modern bowl sink and toilet. Cottage has its own shower room with basin and toilet. Annexe has ensuite private bathroom. Mobile gas heaters as well as log burners. Not required in Summer months. We make all the beds up for your arrival with good quality linens. Large wood burner in Farmhouse lounge. and another in Farmhouse kitchen. Cottage also has a log burner in lounge. We provide bathroom towels as well as pool spa towels for all guests. Wifi and internet available, . INCLUDED IN PRICE IN PEAK SEASON. Additional charge if required outside this period. Lovely large vaulted ceiling lounge in main Farmhouse. Very powerful ceiling fans, making this a great escape to cool down in summer. Cottage has a separate lounge. Large Rosserie Baccuse range cooker. Gas hob . Two electric ovens. There is a microwave oven. All you could possibly need. The farmhouse has the most amazing fully equipped kitchen. ideal for those who like to cok. Large Rosieres double oven with Griddle plate. 4 large burners. Full music library available for your use. Large terrace overlooking pool from Master bedroom. Large private terrace from master bedroom. Many many terraces, sun and shaded. Large covered courtyard with outside kitchen with wine fridge, and outside kitchen sink. There is a very large Oak table for getting together for eating. Aqua spa hot tub. Heats to 42 degrees. The spa is maintained for you during your stay. Cortijo Cuscurro is being offered out for rental, yet is a luxury home. We shall be leaving our DVD 's CD’s so the house will feel more like a home than a rental. Ideal for guests looking for a very large luxury property with plenty of space. Main farmhouse has a large dining room with leather chairs and solid oak table. Outside courtyard dining for 20. Sun terrace outside kitchen with seating for . Total of 10 sunbeds, plus sun chairs. The kitchen has been equipped to a high standard and meets all your needs. Luxury double range cooker, dishwasher, toaster, microwave, slow cooker, American fridge freezer, coffee machine The cottage has a dining room for 6 with outside dining for 6 on private patio. There is a full kitchen with oven, hob, toaster, microwave and washing machine. The lounge has two comfy sofas which can pull out to provide extra beds. This is a beautiful, interesting and spacious property in a stunning location. Three generations of my family recently spent a week here to celebrate my father's 80th birthday. Overall, we enjoyed the week but our stay was significantly impaired by the owners' poor management of the property. Firstly, the property is extremely difficult to find. The directions we were given by the owner was to use google maps from the airport. The problem is that google maps recognizes treacherous little unpaved tracks as roads. Two of my sisters were separately directed by google maps down extremely dangerous dirt roads with steep drops at the side. The owners owe it to their guests to provide clear and safe directions to the property. They also should have signs on the last mile or two of tiny roads leading to the house. Other rental property's in the area had signposts but there were absolutely none for this one. 1. The Jacuzzi didn't heat up. 2. Various family members were getting electrical shocks from simple appliances such as a toaster and a fan. Apparently, this was related to the malfunctioning jacuzzi. 3. The kitchen sink was clogged and mostly remained so despite our various efforts to unclog it. 4. There were not enough heaters. Some of the rooms didn't have any heater and our requests for additional heaters were unmet. Some handymen/electricians were sent out to look at these problems but none of them were fixed. It turns out the owner was on a cruise while we were there and while she had a local friend designated to address problems, the friend (who was very nice) was not very familiar with the property and didn't know how to fix anything or even who to call to fix things. My family was quite disappointed that we never got to use the jacuzzi and it was quite frustrating to have to deal with a clogged kitchen sink and cold bedrooms all week. We still had a really nice week despite the management issues but I really couldn't recommend anyone to stay here under the current ownership. We are saddened to receive this review , after so many positive reviews. With regards to the directions to the Cortijo, all guests including this guest , are sent the Google Maps and GPS location, with instructions to download the directions in their own language. We also supply a contact number should guests loose their way. This will provide step by step instructions from the guests starting point to The Cortijo. This will take you following a route on made up roads. Unfortunately , during this guests stay the jacuzzi main control panel failed. We contacted an electrician immediately, who attended as soon as possible and found the problem, isolated the jacuzzi which rectified the problems in the house. The control panel was ordered as soon as the fault was known, but did not arrive within the guests remaining 5 days stay. With regard to the plumbing, a plumber was contacted, who visited the Cortijo on same day. he advised us that he had cleared a grease blockage from the waste pipe. We were not aware this remained an issue. The two tradesmen that attended the Cortijo are fully certified. The Cortijo heating is as advertised, various log burners, gas mobile heaters and a small number of electric heaters. This was not requested to the property manager on her visit. Julian and myself , look after the Cortijo and take great pride in doing so, however on this occasion, we employed a local lady who does property management in the area, to look after the Cortijo and the guests in our absence . This obviously did not work , so we will not be using them again. Despite being on our annual holiday, we did however keep in contact with the guest throughout by e mail. On completion of the Guest stay, we did offer recompense, for the inconvenienced cause. It is nice to hear that the guests still had a nice stay in our beautiful Cortijo and surrounding area. Hosts Lisa and Julian cannot do enough to ensure that your stay is one to remember. Lovely clean spacious villa with great amenities and superb wifi. Loved it! Will book again! Would love to have you back as you were perfect house guests , leaving it all in great order . Thank you for taking time to review the Cortijo. We are glad you were happy with the Cortijo. The lizards for some guests is part of the charm, sorry to hear you were scared. Closing the windows and doors does deter them, but they are totally harmless and something that goes with the territory. Most of our guests children are delighted just to spend pool days at the Cortijo, however there are parks and a large public pool plus other activities in the Village of Riogordo which is 10 minutes, should you want a break. The waterpark is also a great day out. 15 of us had a great stay at Cortijo Cuscurro. Check in and check out was all very easy and Lisa was on hand if we had any questions. I would definitely recommend the paella, it was well worth it! Thanks for taking the time to write a lovely review. Doing the Paella was a pleasure and you were a great group to have staying. Hemos estado fenomenal. Eramos 3 familias (13 personas en total). La casa es muy agradable y el entorno muy bonito. Realmente recomendable. We had high expectations of thr property and surrounding area from seeing the photos, we were blown away in reality! Lisa and Julian have put love and care into the farmhouse and outer buildings. We were left wanting for nothing as the kitchen and house were extremely well equipped. The furnishings and decor are stylish and of great quality with a touch iof shabby chic..all adding to the ambience of this stunning holiday home. An unexpected bonus was the sound system, after changing to more modern convenient speakers and tablets etc we had forgotten how sublime music sounds on a good system! There was even a cable to connect it to our phones. We will be reverting back to a real sound system!! The music coupled with the amazing views made each day feel like living in a movie or dream! The local town of Rigordio was pleasant and traditional and the supermarket though small well stocked. We highly recommend the local wine sold in cartons especially the rose! We were only there for a long weekend due to work commitments so we were gutted to leave.We definitely plan to return for a longer holiday and can't wait to drive around more of the surrounding villages. Lisa and Julian are a lovely couple who have created a wonderful home and holiday experience for anyone who wishing to get away from it all and experience the real Spain. If you prefer to while the hours in the jakuzi or by the pool, chase the sun on many terraces, lounge on the outside sofas with a book, eat alfresco complete with stunning views or nip out for beer and tapas even drive into Malaga should you wish thus is the one for you!! Certainly for us! Thank you soo much for taking the time to review our CORTIJO . We are delighted that you enjoyed your stay and that you plan to return. The Cortijo is just 10 minutes from the beautiful traditional white washed village of Riogordo. Riogordo is situated 25 minutes inland from the coastal area of Torre del mar with wonderful beaches and a water park. There is a large shopping mall with bowling and cinemas. The Lake of Vinuela is Appox 15 mins drive from Riogordo with lovely scenery and several restaurants overlooking the lake. Riogordo is only 35 minutes drive from Malaga Airport and 55 minutes from Granada airport. Riogordo is a world away from the hustle and bustle on the coast. An excellent road system makes cultural centres like Malaga, Granada, Marbella and Ronda very accessible, with an abundance of golf courses and other attractions within easy driving distance. There is a Farmhouse, Cottage and 2 ANNEXES We only rent to ONE GROUP AT A TIME , so you always have exclusive use of all facilities. TOTAL EXCLUSIVITY AT ALL TIMES. Depending on your group size, you can rent The farmhouse, Cottage and Annexes. PRICING DEPENDS ON GROUP SIZE. FARMHOUSE LESS THAN 8 GUESTS FARMHOUSE AND COTTAGE 14 GUESTS ANNEXES ADDED DEPENDING ON ADDITIONAL GUESTS BOOKED. A week before arrival we require a 500 pounds refundable security deposit. This is best paid on Paypal as stays on account and is just a click of a button to return. WIFI IS INCLUDED IN PEAK SEASON. SMALL ADDITIONAL CHARGE APPLIES THE REST OF THE YEAR SO WE CAN CONNECT WHEN REQUESTED. We now have two Annexes with double bedroom and ensuite available at a supplement .THIS SUPPLEMENT IS APPLIED DEPENDING ON THE NUMBER OF GUEST BEING BOOKED.